I am tickled pink to now have 99 followers!! Yea!! Maybe I'll hit the big 1-0-0 soon! :) **edit!!! Mitzi is now #100!!!! YEA!!!! I am so tickled! WooHoo!! I really like this block! I like the 2nd layout too, but I didn't get to make another one. So cute! And notice the awesomeness with the outer directional fabric?!? All the same direction!! Halloween Quilt - all 9 blocks are done! The applique was a bit of work, but they are so so so cute!!! I am so excited to sew the top together this week!! Twin Frolic - squares are... basically... cut out! I have drawn up the plan and it should come together quickly!! That's all. I really need to step it up this week! 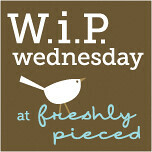 :) Be sure to check out all the awesome WIPs at Freshly Pieced! Happy sewing! I really like your SBS block, it turned out great! Can't wait to hear more about your secret project! I can't wait to see all those Halloween squares; that top one is too cute! And I love your star! I did the other version. Did you see Lee's? I REALLY like how she did hers! Get well soon! the double star block is great, and yes, I did notice the accuracy of the print. Nicely done! Hey - I just realized I wasn't an official follower of your site so I just joined - I'm #100. Yeah! I just always went down my blog list to read your posts. I love the purple legs on the witch and the shoes are just too cute! Great job! Darling applique Halloween boots. So cute - sure to be a fab top. Congratulations on the 100 followers! I love that halloween block, she has great boots! i LOVE the halloween blocks - is that a pattern I can find anywhere??? I can't believe the directional was coincidence. That is incredible. I try to do stuff right ON PURPOSE, sometimes, and still mess it up. Good work. Excited to see more of the halloween quilt.